Here are three ways you can support RHM’s work on this important day. 1.Go to Renewed Heart Ministries’ donate page and make a contribution. 2. 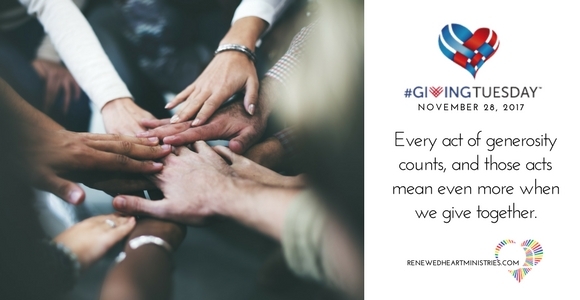 Make your contribution go twice as far by going to Renewed Heart Ministries’ Facebook Page and make a contribution there that will be matched. Facebook and the Bill & Melinda Gates Foundation are matching up to $2 million of donation made through Facebook. Up to $50K per nonprofit will be matched and Facebook is waiving all contribution fees for this special day only. 3. Help us today by Creating your own fundraiser on your Facebook page for RHM and sharing it with your friends. Up to $1,000 will be matched per each personal fundraiser. “Today is #GivingTuesday and you can make your support of RHM go twice as far on this special day. Facebook and the Bill & Melinda Gates Foundation are matching up to $2 million of donation made through Facebook. Up to $1K matched per personal fundraiser or $50K per nonprofit will be matched. Facebook has also waved all of it’s contribution fees for this day only. However you choose to support RHM’s work today on this #GivingTuesday, thank you from the bottom of our hearts. It’s because of you that we are able to exist and continue being a positive force for change.